I recently received an email from a YTC reader with an incredibly important insight into trading success. I heard this recently while watching football. It's not how many great plays you make, it's how few bad plays you make. 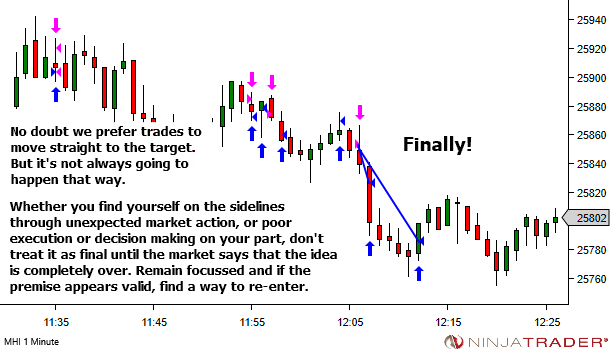 I immediately emailed this to myself because it is so applicable to trading. 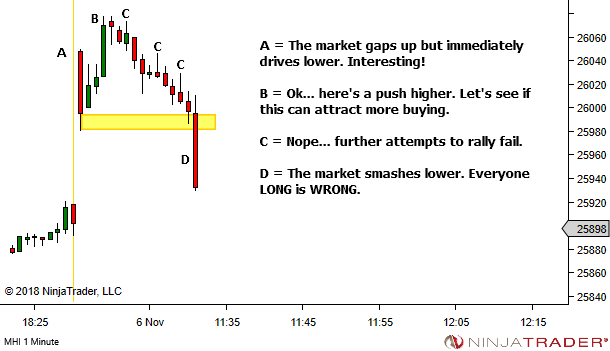 I know where the good places are to trade, but the key is waiting for price to get there and not "forcing" a trade. 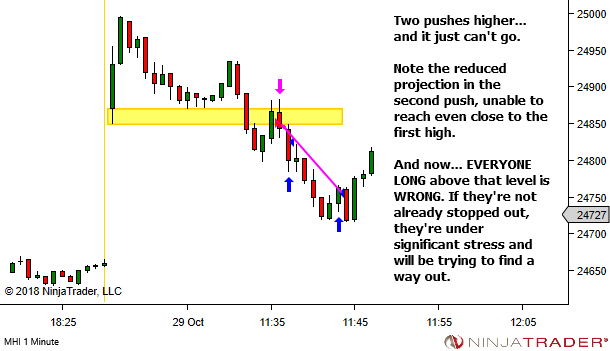 It also ties in well to your Facebook posts last week and the latest blog article. 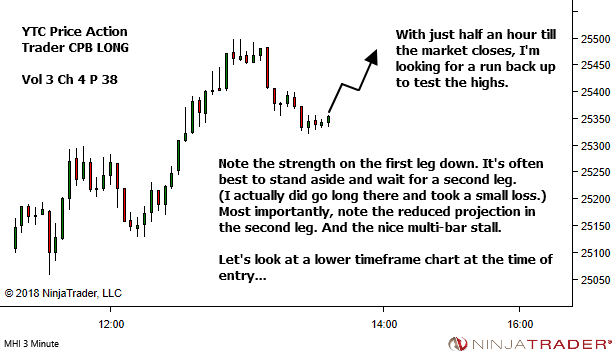 This is absolutely 100% applicable to trading. 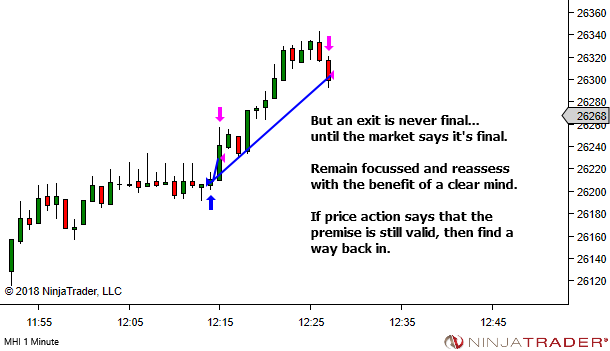 It's the counter-intuitive path to trading success. 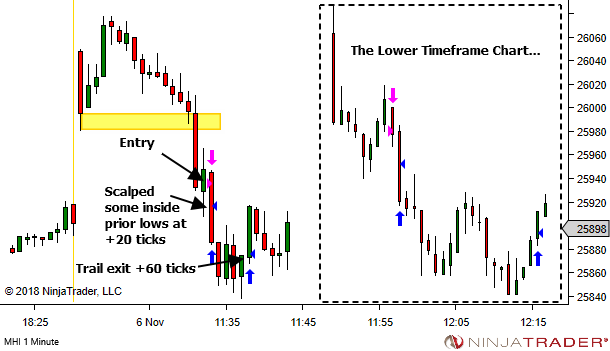 Reduce the number of bad trades. 1. 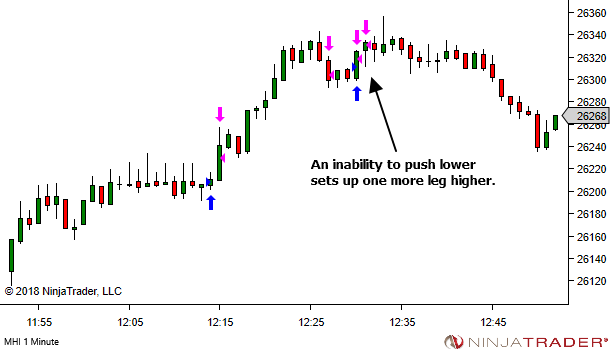 We limit our trading to our best setups only. 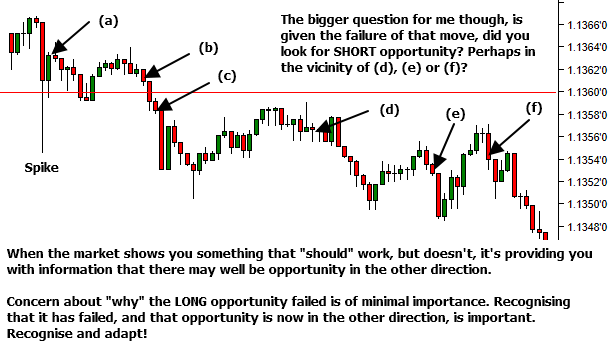 Get absolutely clear on what an A+ trading opportunity should look like. And then cut out anything that doesn't meet these strict requirements. Define the context. 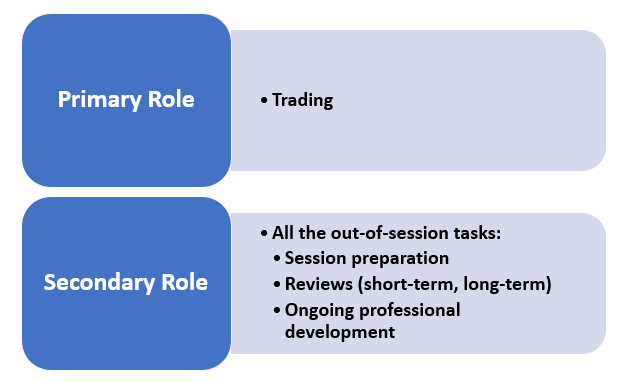 Where will these trades be found within the wider market structure? 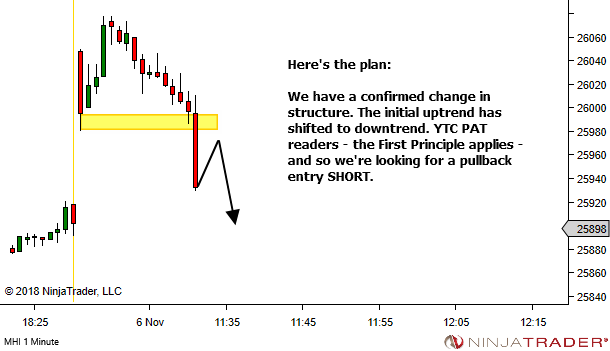 Now limit trading ONLY to those places on the chart. 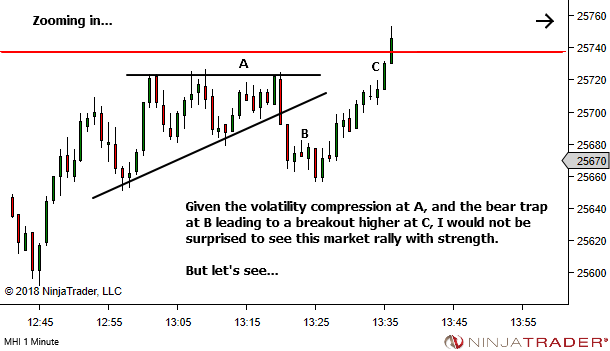 How should price be moving (speed, volatility, smoothness)? 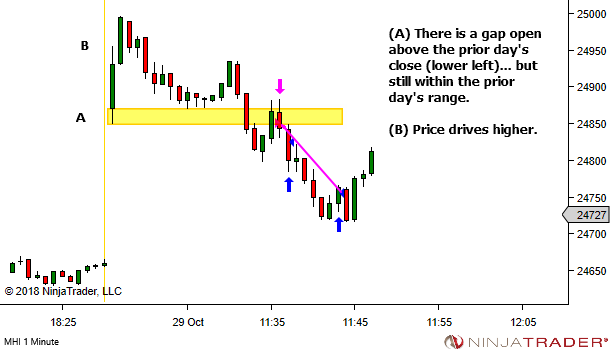 Define your ideal conditions and put in place controls to ensure you trade ONLY when those conditions are in play. 2. We have a predetermined plan for execution. 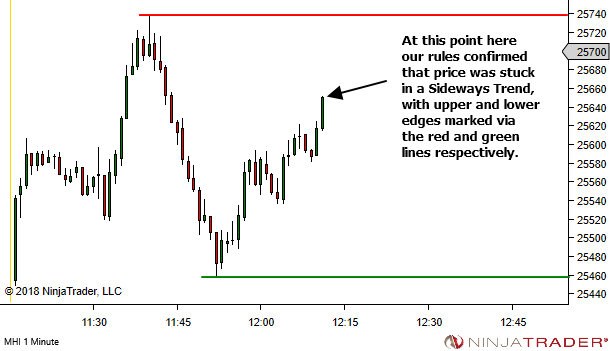 Now that we're limited to trading only within an ideal context (market structure and price conditions), you need to be completely clear on how you execute and manage your trade opportunity. 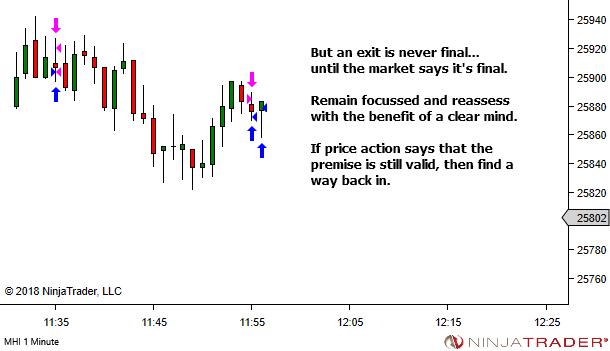 Consistency in execution requires standard default plans with regards to sizing, entry triggers, stop and target locations. 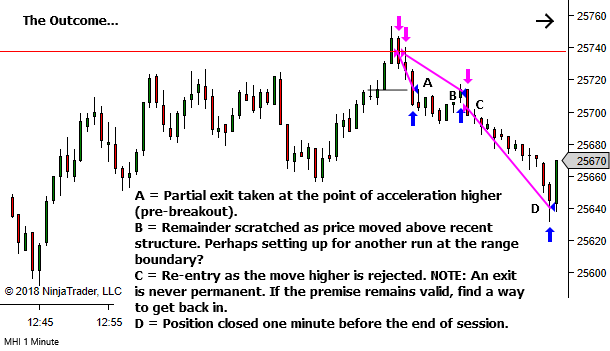 Plus any additional techniques which might be relevant to your style of trading, such as when you will scale in or out, or under what conditions you will re-enter if stopped out. Your decisions may involve some discretion. That's fine. But this discretion should be built into your standard management plan. 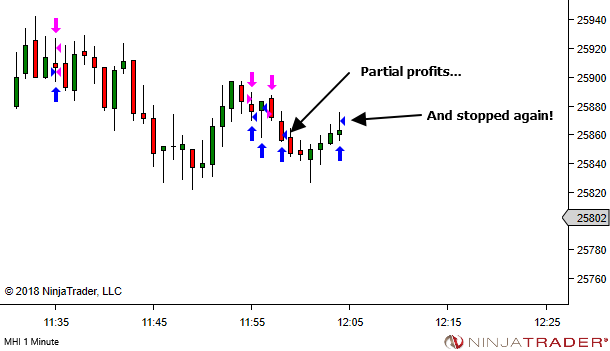 You need to know what to do… and when to do it. No hesitation. 3. We monitor our performance to identify and reduce errors. Track everything! 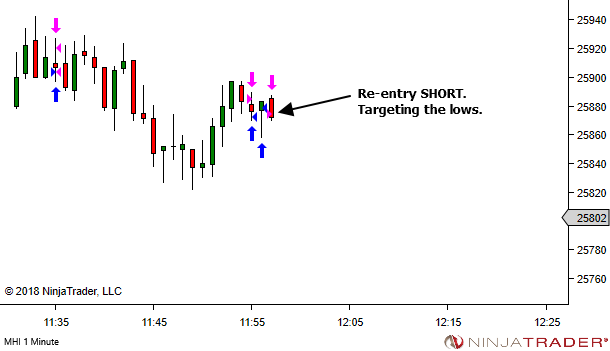 If you make an error or poor decision, record it. Look to your longer term stats during your weekly or monthly reviews. 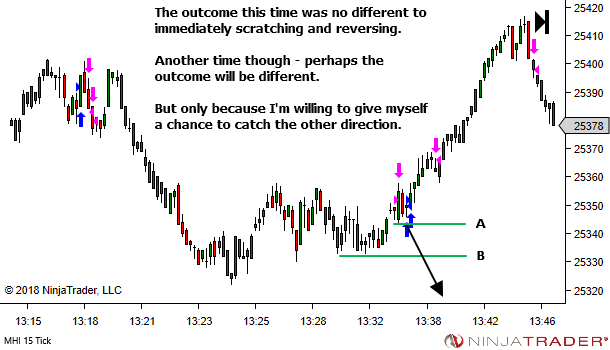 If you find something repeating over time, then that is cause for celebration. You have found a way to improve your edge. 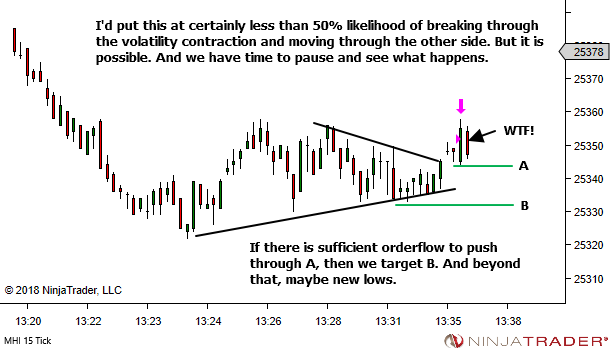 Find a way to cut out the error, or at least reduce the likelihood or frequency of occurrence. 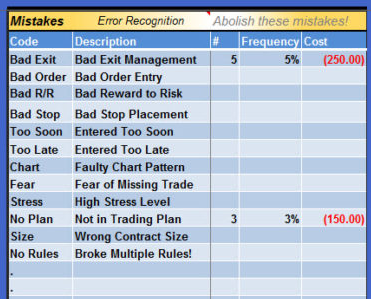 Image: Error tracking via the Trading Journal Spreadsheet! 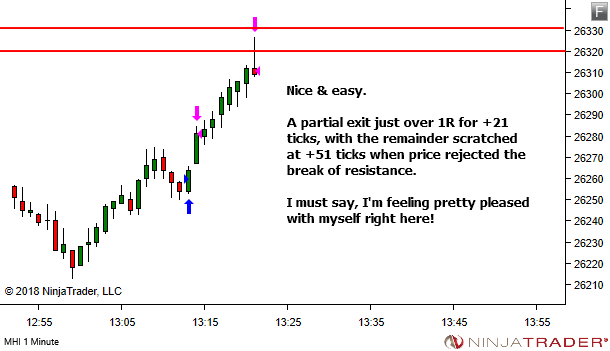 Trading success is already there. It's just hidden beneath all the errors and poor decisions. 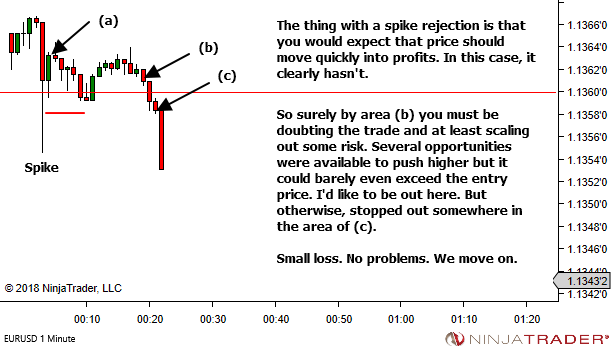 We just need to chisel away at them, getting rid of the bad trades and poor decisions, and allow the underlying success to reveal itself. When the market is stuck in a sideways trading range, the primary place to look for opportunity is at the upper and lower edges. 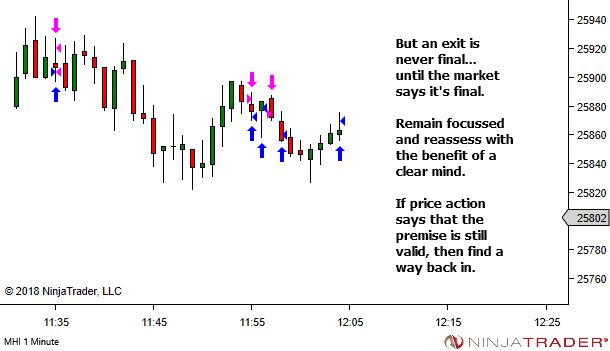 Focus on the areas of the market structure that jump out at you. 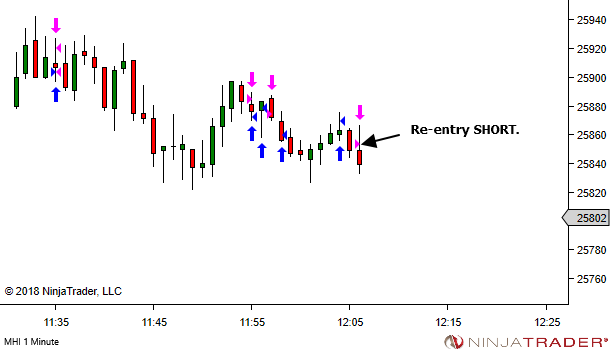 The sequences that are so obvious, so easy, that you'd be kicking yourself if you missed the trade. Identify them. Study them. Learn from them. And then trade ONLY them… until you've got a proven edge. 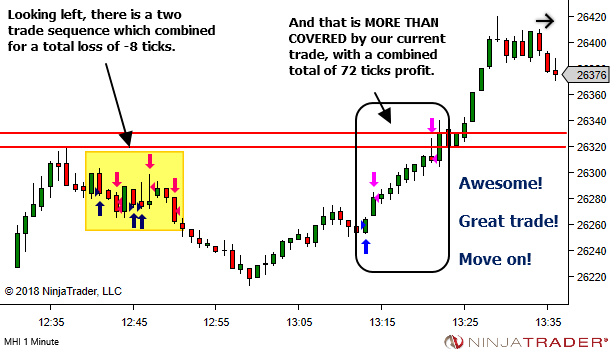 These are potentially your A+ Trades. The ones you will aim to master. 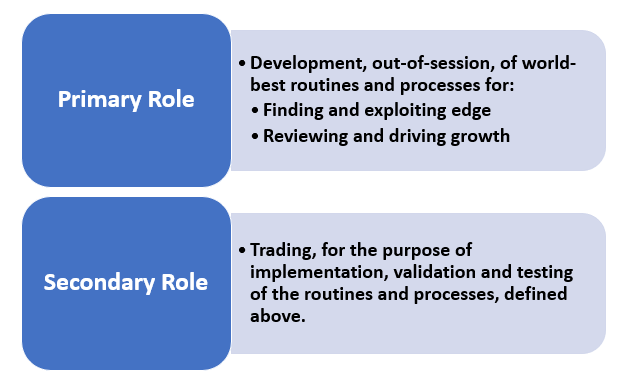 This was followed up with a social media post on Tuesday, comparing the trade sequence from that article with another from a previous article. 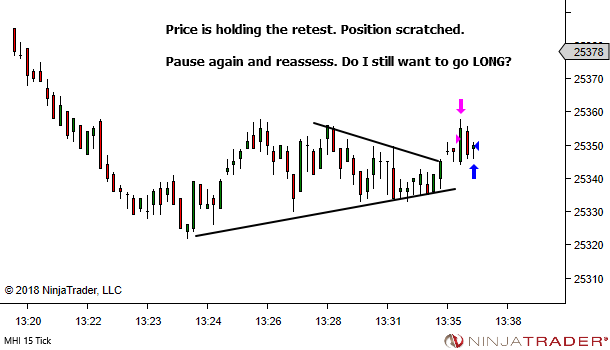 These trades come easy to me. The ones that come easy to you might differ from this. Your job is to find YOUR OWN A+ opportunity and get to know it in detail. There are more trades coming soon. You need to be ready. 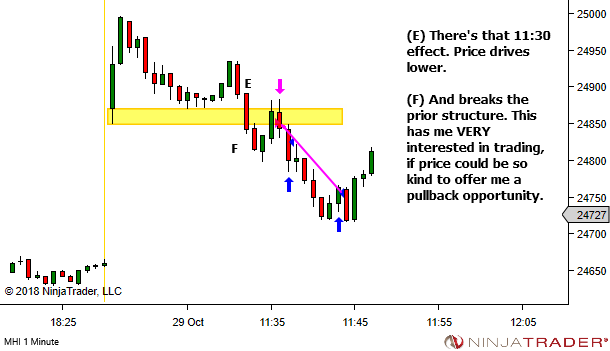 Note again how similar it looks in structure to the prior two trades. 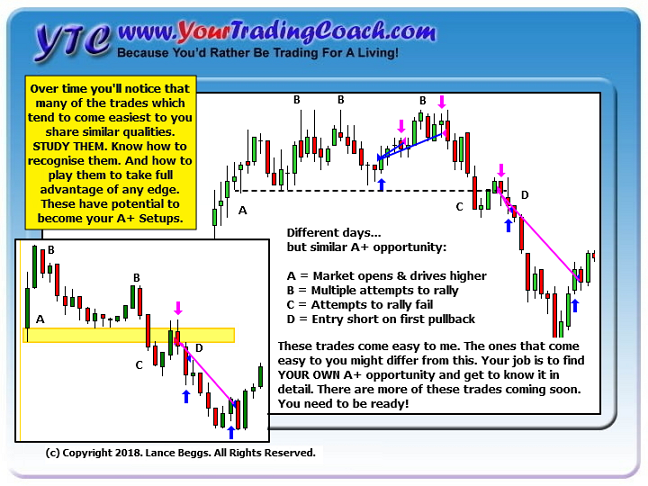 Your favourite trades will all share similar qualities. 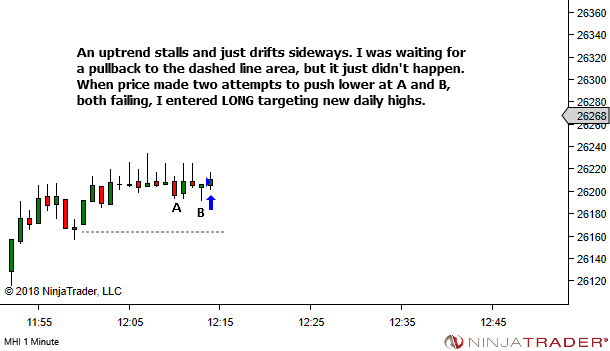 And this first pullback after a change in structure IS one of my favourites. It might not be one of your favourites. And that's fine. 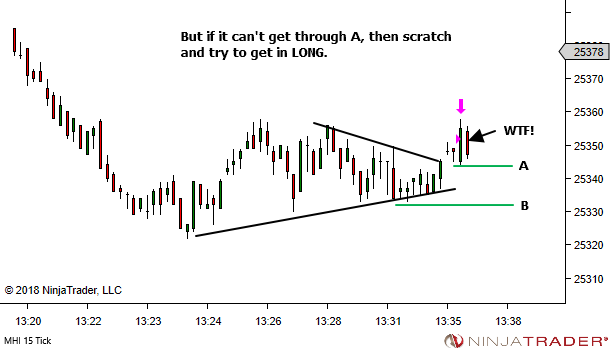 The idea is not that you should start trading these setups. You need to find your own. 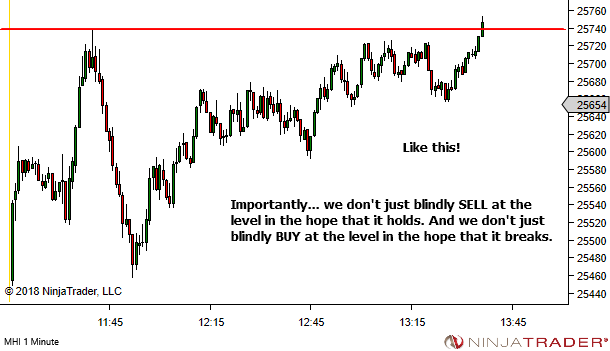 If you're struggling, then please note that this could be the key insight you need. 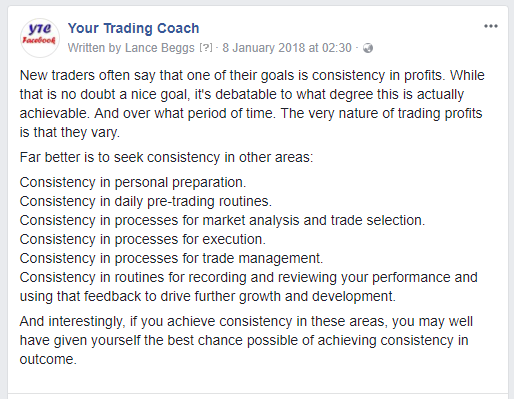 I just wanted to thank you for the last Friday's article and let you know that I find articles on this theme of great value. This is exactly what makes all the difference for me. 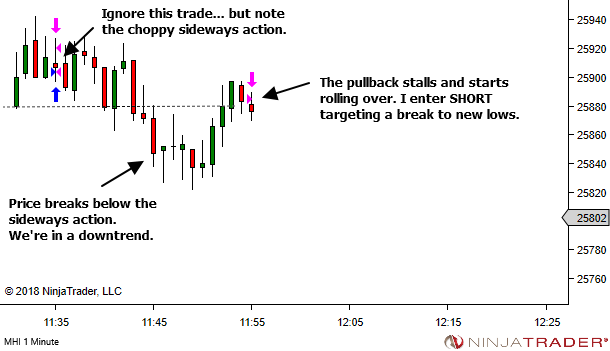 The shift in mindset that made me focus on the moves that I find obvious and easy has greatly improved my trading. 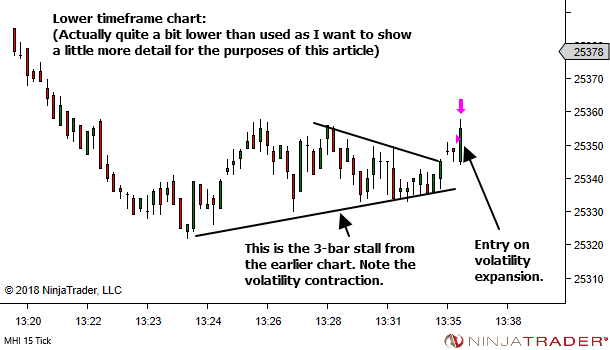 I regularly come back to the article "Focus on the obvious moves first" that was the first article that made me review my trading and think about whether I take mostly the obvious trades or not. 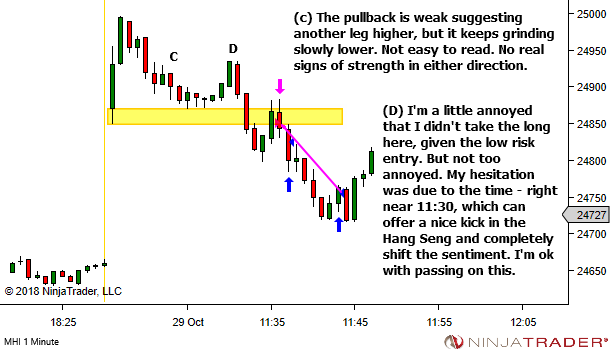 This has helped me to get rid of many marginal trades. Last week's article reinforced this practice for me. 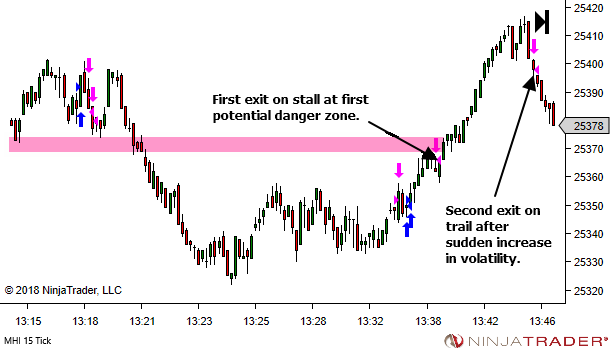 I think that this may be a key thing that developing traders need to focus on. If I may, I would suggest that you follow up with more articles like this, that would be great. Repeating the key point from the email: "This is exactly what makes all the difference for me. 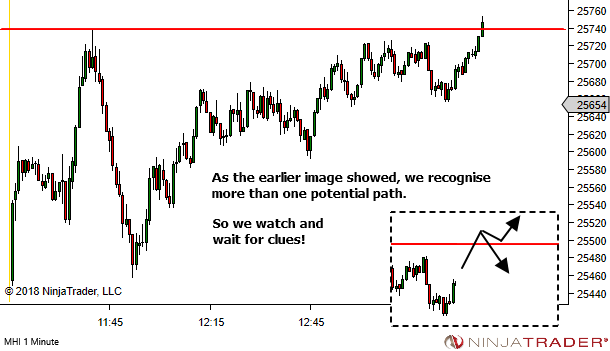 The shift in mindset that made me focus on the moves that I find obvious and easy has greatly improved my trading." 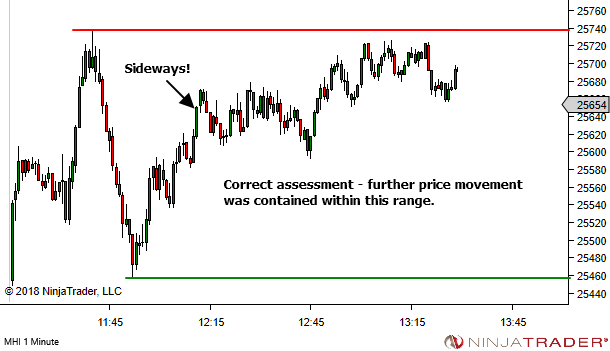 Could this be the difference you need as well? 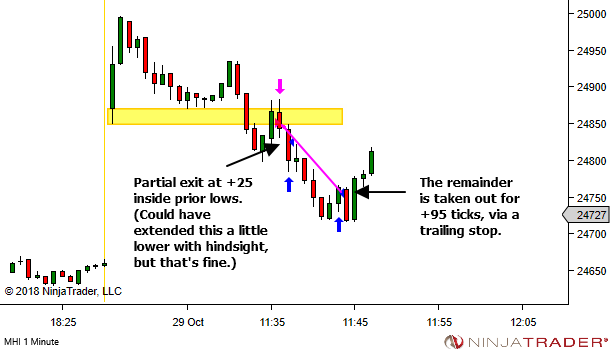 There are some trade ideas you look at with hindsight which are quite complex and which may have been difficult to execute. And there are others which jump out at you as being really simple. 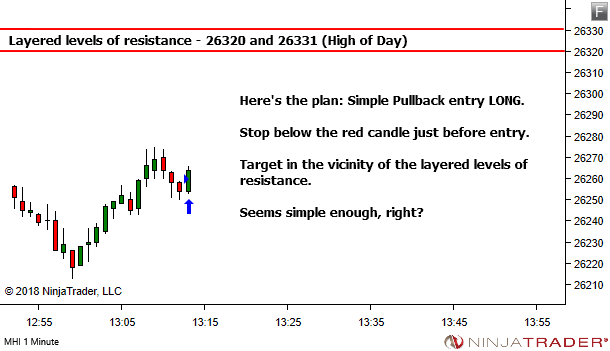 If you're not yet profitable, then focus on the SIMPLE trade ideas. Identify them. Study them. Learn from them. And then trade ONLY them… until you've got a proven edge. What you see as simple may be different to what I see as simple. 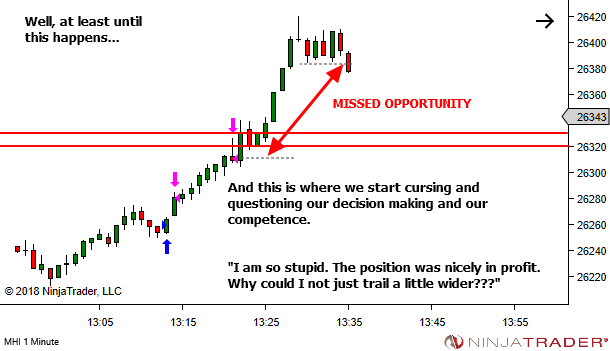 But essentially, we're talking about those you would call your A+ trades. Look at any historical chart. They're the trades which your eyes go straight to. The ones that are immediately obvious. The ones that you'd be kicking yourself if you missed. They're the ones you need to focus on first. 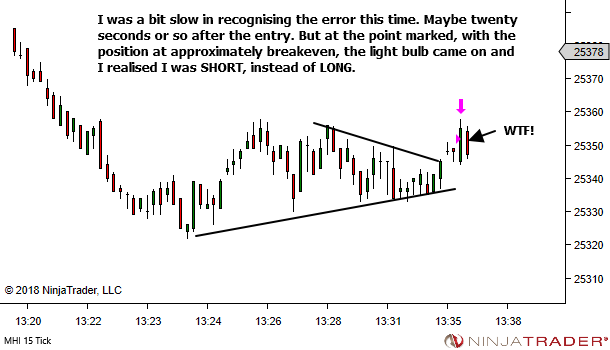 For me… one of my favourites is the first pullback following a significant change in structure. 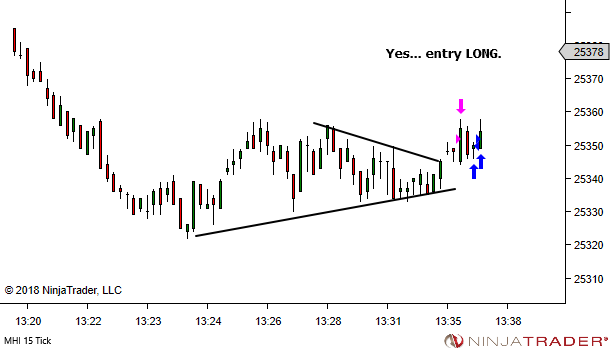 This trade… and every trade like it… jumps out of the chart at me. 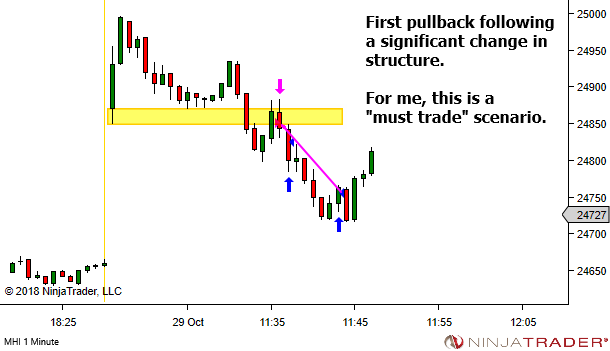 If there is a "first pullback after a change of structure" trade that I miss, I'm seriously not impressed with myself. 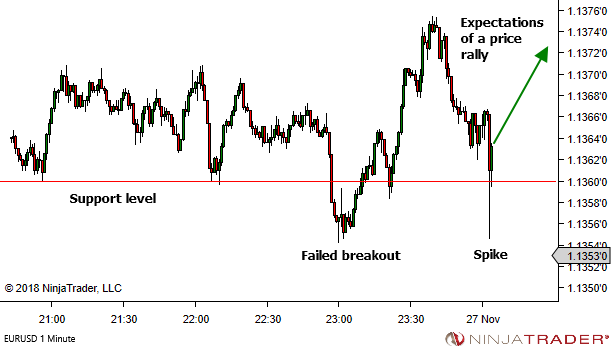 What trade opportunities jump out of the chart to you? 1. 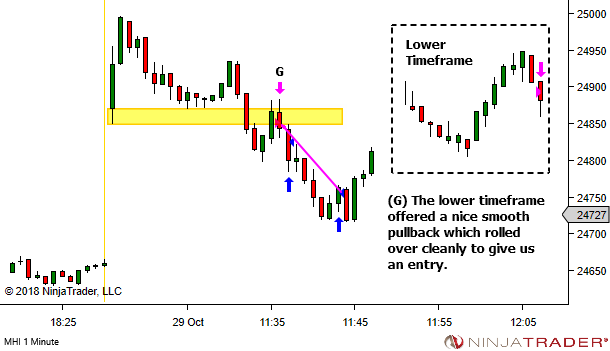 YTC Price Action Trader readers – From the YTC PAT perspective the trade is simply the first PB opportunity after a transition from uptrend to downtrend. 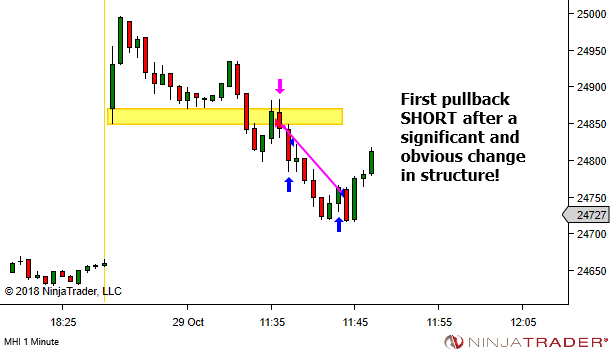 The classification of uptrend is not immediately obvious due to the lack of structure this early in the session. 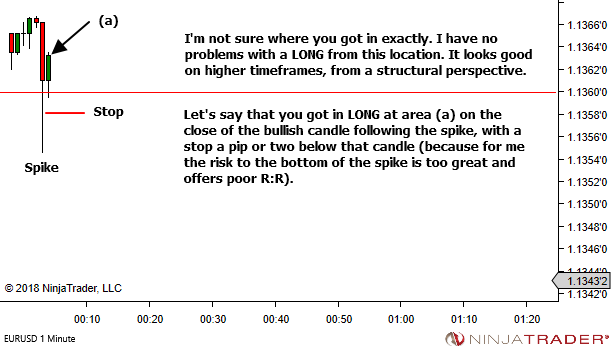 In the absence of any pre-session data, I will usually make use of any opening gap and also an opening range bias. 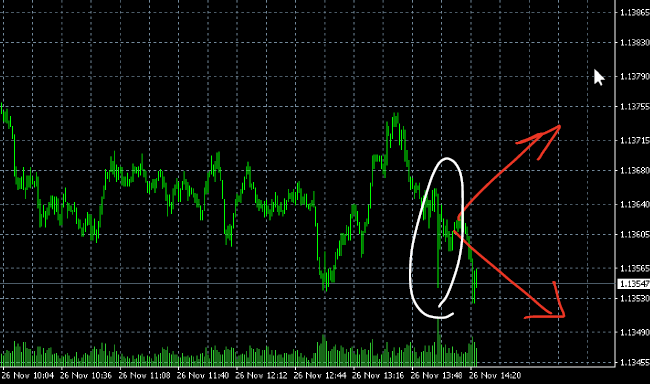 With both being bullish in this case, I'm happy to call an uptrend. 2. 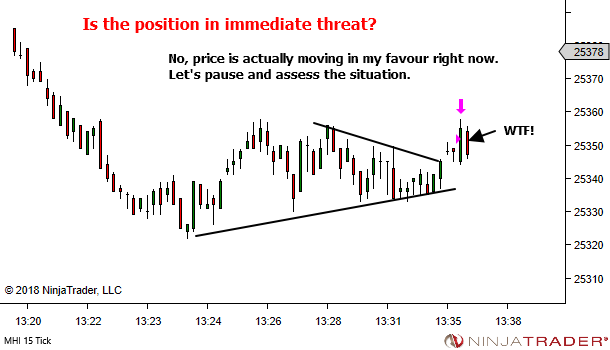 Note the similarity with the trade in this post. 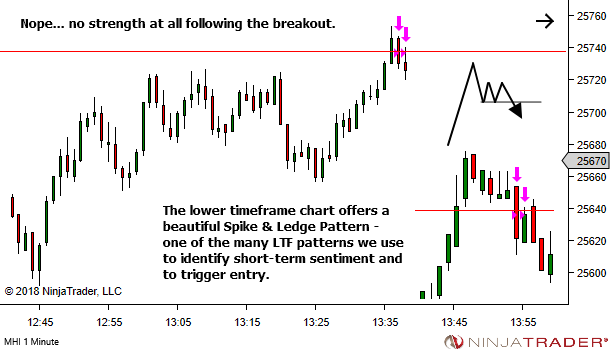 Even though it's pattern sets up on the higher timeframe chart, the concept is exactly the same. 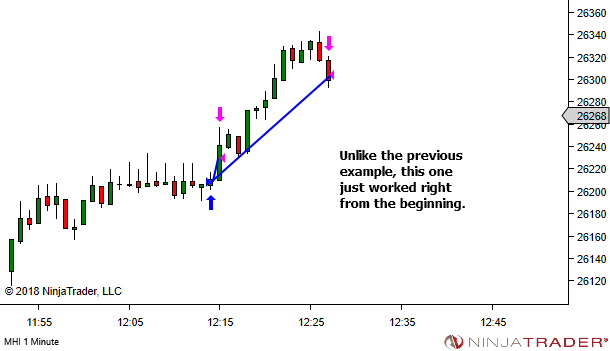 You'll start to notice that after a while – all your good trades share similar qualities. 3. The reference to 11:30 is of course my timezone (UTC+10). The time at the exchange is 09:30. 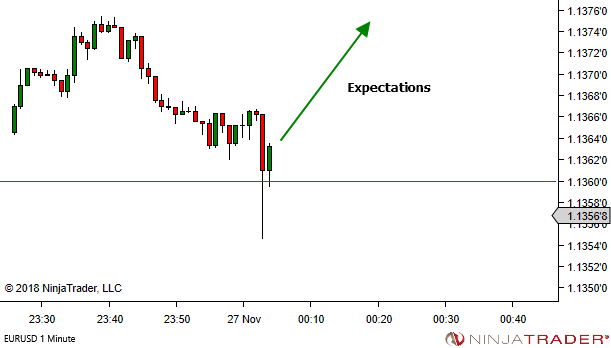 This is the time that stocks commence trading on the Hong Kong Stock Exchange.